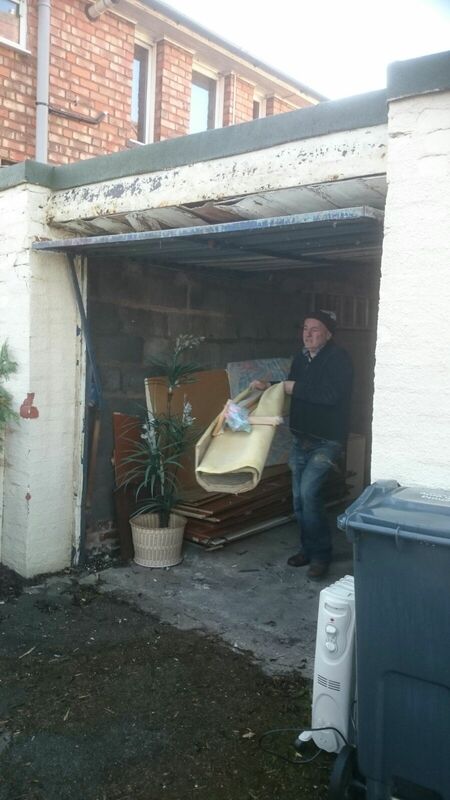 From time to time we are approached by clients with cluttered sheds that need clearing. This shed, which contained a large loft, was one such example. The shed, was equipped with two large doors opening into a garden. Unfortunately much of the wooden floor was rotted and damaged creating great difficulties. Further complicating the matter; a fierce rain storm had recently churned the property’s drive into a dense patch of mud. Fortunately, our team is used to working in difficult circumstances and comfortable in their work boots. With our customary ‘can do’ attitude we set to work! Our client, a man in his early thirties, had agreed to babysit his sister’s twin sons for several weeks while she honeymooned in Ibiza, alright for some! The two boys were apparently quite curious; therefore it was important for us to make sure the shed was cleared of hazardous items. Our team arrived at 11 am and eagerly began our work. As with many of our jobs, the first thing we did was asses the area for both dangerous chemicals (and materials), and potentially valuable items. And as with most of our jobs, we found both. The shed contained around thirty cans of toxic lead based paints, several canisters of lye, and various corrosive acid cleaning products. Many of the containers for these items were rusted beyond being safely removable. Fortunately, our team is experienced in handling such objects and did so in an environmentally friendly and legal manner. We were happy to see these products removed from the reach of children and family pets! As we progressed deeper into the shed we also discovered several vintage wheel rims (collectors’ items), an imported 1950s child size John Deere tractor, and various cast iron tools. We also discovered crates full of old clothing, and a very cool, solid wood, work bench. In the attached loft we discovered skiing equipment, every yard game imaginable (crochet, bowling balls, etc. ), and numerous boxes containing magazines. Many of the boxes containing the texts were water logged and fell apart while lifting them. The most interesting find of this Dorridge shed clearance was a world war two era automatic rifle with associated ammunition, stuffed into a wooded gun chest behind the work bench. Being a legally sensitive item (this isn’t Alabama after all! ), we consulted with a retired police officer we are associated with, who helped our client dispose of it safely. Again, not an item you want around if you have small children. By midafternoon our clearance was complete leaving and empty space and a happy, if surprised, client. As usual, our client was quite surprised by how quickly we were able to clear the house. He was even more surprised by the discovery of an illegal fire arm on his property. In the end, this was a straightforward, if perhaps memorable, clearance. As always, we were happy to help. Check out a bit of Dorridge history. Do you require a Dorridge House clearance? We are available 9am to 8pm Monday to Sunday and have years of experience in the Hollywood area including Knowle, Bickenhill and Meriden. Please don’t hesitate to get in touch, we’re a sympathetic professional service running for over 30 years with experience in a multitude of housing types.